The C'tan Shard needs to phase out of this list; the last time they were a worthwhile choice, that rule still existed. 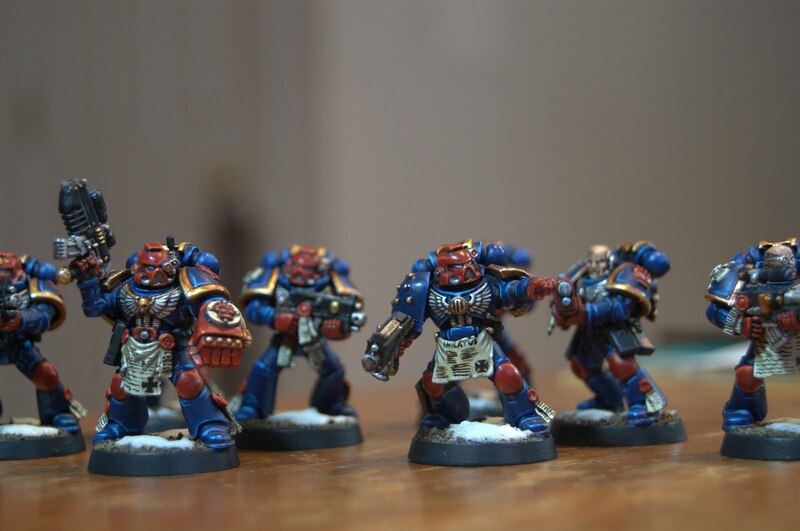 They look cool and I really wanted to get them to work in the new codex, but I just haven't found a way. That's not to say there isn't a way, but it'll take a better player than me to figure it out. Maybe if you teleport him in with a Monolith... but that's a ridiculously expensive combo with a whole new set of challenges. For the time being, the Nightbringer is getting shelved. Next up, Wraiths. I need more of them in order for them to be effective. 3 just isn't enough. By the time I would reach close combat, I was usually down to 2 at most (and it was never the 2 with whip coils...) so then I found myself losing/drawing the assault, even to bog standard units like a space marine combat squad. I think upping this unit to 5 or 6 bodies would do the trick -- more wounds to go around and more attacks to get those juicy rending strikes. The other fast unit in my army is Scarabs. While I originally planned to run more of them, they were the first unit I started subtracting from when I needed to free up points. The ability to generate more with Spyders makes this all too easy. And, hiding 3 bases out of LoS first turn so they don't die isn't that hard. They aren't great against close combat oriented units, but they absolutely melt armor and can make a decent tarpit for scary units if need be. 45 pts for 3 is a steal, and if I can free up more points I'll take a second squad. Combined with 3 Spyders, this combo is totally worth it as it can single handedly deal with mech, creates a huge distraction for opponents, and provides excellent counter attack for protecting my troops. More Troops. Not much to say here other than I'd like to max out the Warrior & Immortal squads I have and add more units of them if I can. In my experience, Gauss has been superior to say Tesla Carbine Immortals, but ultimately the thing that makes these units is their staying power. Add a Resurrection Orb Lord to each if you can and watch your opponent's shooting become mostly ineffectual. Also in the 'more' category: Tesla Destructors. Either with Annihilation Barges or Nightscythes as both are great choices. But wow, 90pts for an AB... almost makes you feel a little dirty with how good this is. Especially when it downs a 250pt Storm Raven in one turn, ouch! This was Alex's first encounter against Necrons since their new codex, so to say he was a little surprised by the rise in power level for the robots would be an understatement. I think a comment from a bystander during our game put it best: "It always pains me to witness a player experiencing the power of the new Necrons codex for the first time on the table." 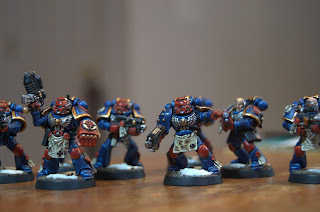 Alex hadn't read the new codex or heard much about how they had changed, so we discussed some of the big stuff while we were unpacking our armies and setting up the board. Things like Entropic Strike, Whip Coils, Mindshackle Scarabs, rolling a 6 with Gauss and Tesla weapons, and how 'We'll Be Back' rolls can be taken against everything now unless the unit is wiped out... Man, when you mention all those things back to back, and consider points costs mostly went down in this book, they start to sound REALLY good, almost too good some have said. This got me thinking about the drawbacks to the army; phase out rule is gone, so there goes the biggest one. They have unprecedented firepower, amazing survivability in the form of Reanimation Protocols/Ever Living, cheap access to a lot of AV13, and the best Flyer Transport in the game (for now). I think the only weakness is in close combat where Initiative 2 will mean you get wiped out if you lose combat and fall back. I agree that Warscythes are one of the best power weapons in the game right now, but you need the protection from Mindshackle or Whip Coils to guarantee that you can swing it. Despite all of this, I still can't say they are too overpowered. 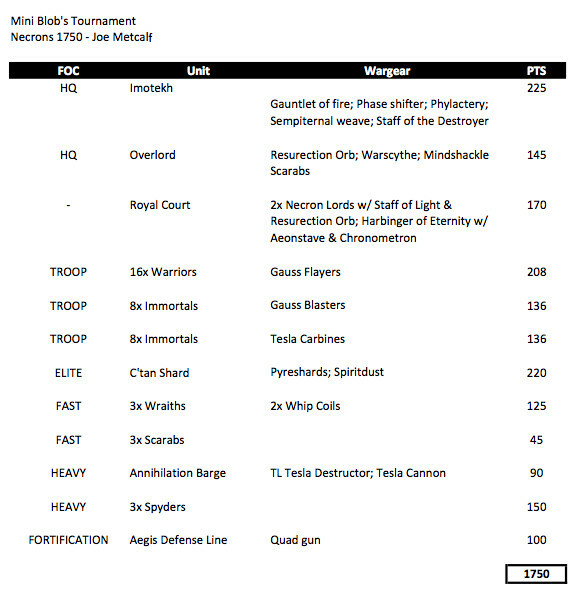 As much as I wanted to believe that about Grey Knights after they came out, the evidence just isn't there to support a claim like that (these armies are not the only ones winning events). Sure, you find larger percentages of players bringing GKs and Crons to tournaments this past year, but I feel that is more because these armies are the new shiny kids on the block. I think you are going to see the same thing with future 6th edition codexes -- just wait and see how many Chaos and DA armies that will pop up in the coming weeks & months. I will agree that these armies (GKs & Necrons) seem to have fewer weaknesses than older books and both have low-cost spamable power units, which as a result make them feel easier to play. 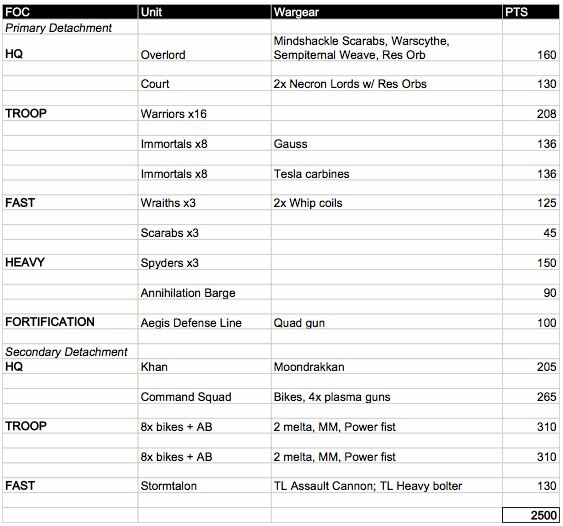 My experience so far with Necrons in the handful of games I've played with them is that they are a more forgiving army in terms of tactical decisions -- certainly more so than my Space Marine Bike lists. But this is more a symptom of the game we play and how army updates roll out over time; what was new becomes old and what was once good becomes 'not so good' when compared to what follows. Each new release seems to trump the last, or "codex creep" as it is often referred to. This is even more apparent now because the game just entered into its 6th edition, so the gap between recent books that were written for 6th and older books that were written for 5th (or even 4th!) will feel much larger right now until more of the books are updated. I've already gone way off on a tangent here, and much more could be said about this topic, but this much is true: while 6th edition is a different beast, the game as a whole has never had all army books perfectly or competitively balanced across the board from edition to edition. The great equalizer for any game like this (which is not chess) is to strive to have FUN. For some, this will be reading the backstory/fluff, building and painting the models, playing in tournaments with the latest and greatest redundant build, or whatever you make of it. When it stops being fun, change things up. I'm not going to worry so much about what army is "the most powerful"; inevitably, things will change. Even if it takes awhile between updates, people will get bored playing the same army or with an army that feels like it has training wheels. We barely got halfway through this game, but what was FUN about it was seeing the spectacle of 5000pts of awesome looking models duking it out on the board. For me, I don't think that will ever get old! Alex is a great opponent and we always have a good time. He was a good sport even though his dice were failing him miserably (and mine were as hot as the sun most of the time), the mission and deployment were not in his list's favor at all, AND he was still able to crack a smile even after driving his Land Raider towards my Scarabs ;) Now that's a stand up guy! Till next time, don't forget to have fun!